Democratic presidential candidate Hillary Clinton paid a surprise visit to the set of Scandal on Monday night. She sat next to "President Fitzgerald Grant" and observed as Scott Foley directed the 17th episode of the season. In fact, actor Tony Goldwyn (Fitz) helped campaign for Clinton last week in Nevada. "So, this happened while I was directing tonight," Foley captioned on an Instagram pic of the former Secretary of State sitting next to Scandal prez Tony Goldwyn. "No big deal. #imwithher." 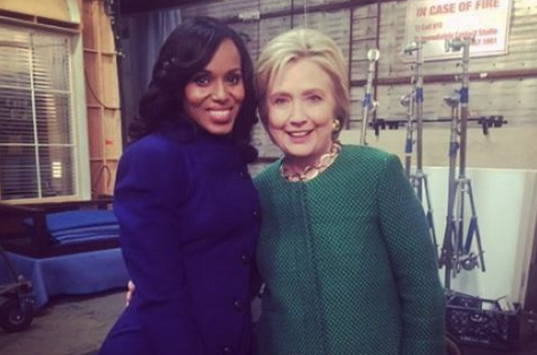 "A good friend came by set today," Scandal star Kerry Washington (Olivia Pope) captioned another pic of Clinton on set. "Proud to say... #imwithher."